Talithia Williams, a statistics professor at Harvey Mudd College submitted this picture and remembrance from Spelman College. Talithia is on the left, Dr. Falconer is in the middle and Ebonii Bell (now a Senior Systems Engineer at Raytheon) is on the right. 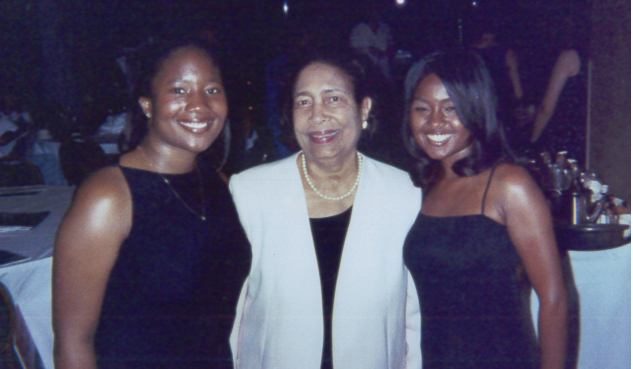 Dr. Etta Falconer joined the Spelman College faculty in 1965. She was the 11th African American woman to earn a Ph.D. in Mathematics and mentored numerous African American women, myself included. I first met her during a pre-freshman summer science program at Spelman. She was the first African American woman I had ever met that had a Ph.D. in any field. Her passion for mathematics was contagious! She inspired me to go to graduate school in mathematics and ultimately get a Ph.D. in Statistics. These days Talithia, a dynamic speaker, is often asked to give talks about her statistical work related to glaucoma. She now gets to be a role model like her mentor, Dr. Falconer.